Advancement in robotics is pretty mind boggling.. 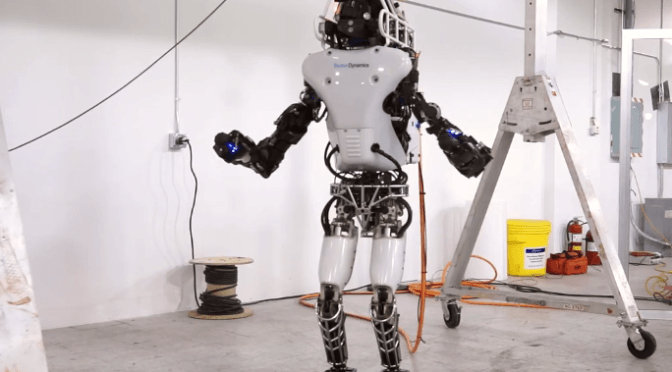 This robot can walk in snow & stand back up if it falls down..
A new version of Atlas, designed by Boston Dynamics to operate outdoors and inside buildings. It is specialized for mobile manipulation. It is electrically powered and hydraulically actuated. It uses sensors in its body and legs to balance and LIDAR and stereo sensors in its head to avoid obstacles, assess the terrain, help with navigation and manipulate objects. This version of Atlas is about 5′ 9″ tall (about a head shorter than the DRC Atlas) and weighs 180 lbs.